Reconditioned Radiators Coolum for Car, Truck, Marine and Heavy machinery. 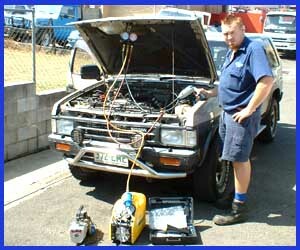 Call out on site Auto Air-conditioning service we come to you for regass and hose repairs. 7 - 5pm Mon to Fri 7 - 12 Sat. Almost everything listed below can be repaired or replaced. Until the system is dye tested or checked for stain marks, we are unable to quote or troubleshoot problems over the phone. All air conditioning work comes with a warranty and systems are fitted with a florescent dye to be checked two weeks later for a fluoro UV check. Hi Tech Sunshine Coast Radiators and Air conditioning cover all fields from automotive to truck. All checks on air conditioning systems are written on a job sheet and quoted free of charge. These sheets are filed in case of further complications and can be easily accessed to review the previous service completed. To all trucking companies, busy businessmen and women or even people who simply want to stay in the comfort of their own home, we offer mobile, on-site service of your air conditioning system. For MORE information on air conditioning and a personalised response please select 'Contact Us' on the menu.